A coin operated vacuum system or automatic vacuum system is one of the conveniences offered by car washes and other small businesses for their customers. Car wash vacuum systems are very popular for those customers that want to wash and detail their own car. They will use a neighbourhood carwash but also want to be able to vacuum their vehicles. These vacuum systems are a plus to the do-it-yourself car washes that many customers want. The auto carwash vacuum systems and accessories are used also in apartment complexes, town-home properties, and small businesses that handle their own fleet needs. These systems are not very costly when the profits are realized from the small initial investment. There are varying sizes of auto carwash vacuum systems relative to the suction capacity. Higher altitudes and hose length may require a larger motor. Choose a system that will meet the needs of your customers and that comes to an outgrown status in a short period of time, costing you additional money. Begin with car vacuums that can serve your business for a long period of time. Using coin operated carwash vacuum systems requires little maintenance and generates revenue in addition to providing convenience to your customers. The coin operated auto carwash vacuum systems and accessories can be added to your self-service car wash operations or standalone on apartment or town-home properties. The coin operated vacuum systems also provide a long-term service for the price you pay. They are also dependable and a great revenue-generating piece of equipment. The design is colorful and eye-catching and is easily maintained. The ease of use adds even more incentive to purchase this system. These auto carwash vacuum systems including accessory prices start at $1500-$3000 which is a reasonable start up cost when you find the profits generated by such pieces of equipment. An investment into one of these systems will pay for itself in less than two months. The auto carwash vacuum systems are easy to clean and the outer appearance is pleasing to the eye. The outer materials are of high quality materials that are sturdy and can keep its sleek and clean appearance for years. Along with this system, include accessories such as the high pressure washers and easy coin operation that will insure that your business venture was the right choice. Once your new car wash operation is bringing in the profits that you expected, you may want to consider expanding your business. The low capital required to start the business is well worth more investment. 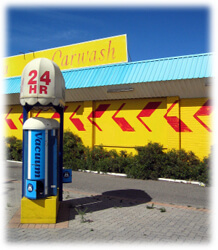 There are other businesses that could be managed along with your car wash equipment operation. Consider a larger business with the great high-pressure washer, the car wash vacuum, and an oil change bay. That could easily bring in additional revenue without expending a lot of money. Even expanding with a number of fuel tanks will also keep the customers in one area and they can be supplied with an oil change, fuel, and car wash.